With the necessity of multiple accounts in our days the probability of losing or forgetting passwords is rapidly increasing. Email Password Hacking Software is a very helpful application that offers a user friendly and simple solution for recovering your lost password from local system memory. It supports cracking passwords of all login based web forms like Gmail, Hotmail, MSN, AOL, Lycos and various social networking websites like MySpace, Orkut etc. This password cracking application can break the secret code string of all Windows applications like Microsoft Office documents (Word, Access, Power Point, Excel) , Adobe Acrobat files (pdf) and other password related programs like WinRar, WinZip etc. Email Password Hacking Software offers password recovery or reset for all FTP clients (FlashFXP, SmartFtp and CuteFtp), search engine and news group accounts and Autocomplete form. Passwords can be any length or complexity and all major browsers are supported, including Internet Explorer, Mozilla Firefox, Opera and Netscape. The free demo version is available with help included and no additional requirements to install it. Email Password Hacking Software works on all Microsoft Windows operating systems (98, 2000, 2003 Server, NT, ME, XP Media Center and Vista). - Fetch IDs and passwords for various e-mail login forms like Gmail, Hotmail, MSN, AOL, Lycos etc. 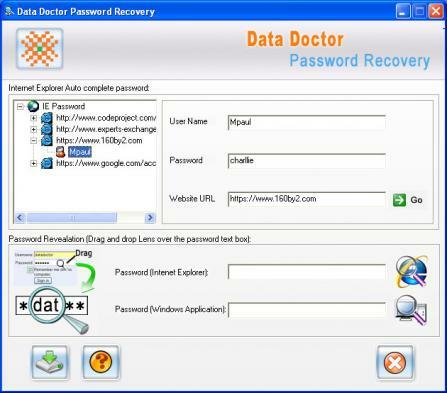 - Password recovery for social networking websites (MySpace,Orkut) and Yahoo, MSN Messenger and Google Talk. - Hacks Asterisks encrypted passwords in alphanumeric character format. - Breaks code string for passwords of all Windows applications (Microsoft Word, Excel, Power Point, Acces; WinRar, Winzip, pdf etc.). - User friendly graphical interface. - Supports all major web browsers. - Password decryption for Autocomplete form, search engine, online shopping and news group accounts from internet cached. - Recovers email id password of any length or complexity. - No additional requirements for installation. lots of cons cant say them !! Can't download. Suspicious legal status. Can't download and don't recommend anyway. Always being re-directed to something else. Cannot download the password recovery 2.0.1.5 A scam? Tried to contact via the yahoo e-mail provided and my mail was returned undeliverable because the user does not have a yahoo account...go figure. Would love for someone to contact me! Someone who knows how to make this work! discovermypassword.tk , or through our mail : discovermypass@yahoo.com. We will be happy to help. I;m trying to downlod a hacking software.. but I can't!! I need to know how to download? it's coplicated.